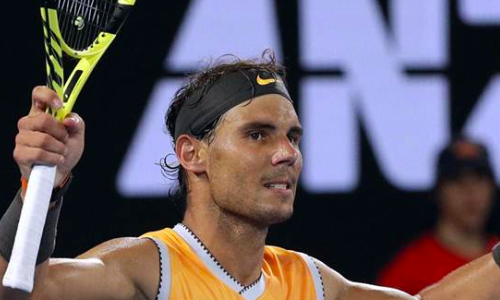 Rafael Nadal seemed to have enjoyed every bit of his 6-3 6-4 6-2 win over US youngster Frances Tiafoe in the quarter-finals of the Australian Open on Tuesday. The Spaniard was at his brutal best – as has been the case all through the tournament so far – as he served 11 aces, won 84 per cent of the points on his first serve and consolidated his servicec games throughout to seal a semi-final date with Stefanos Tsitsipas of Greece. And, he did seem to have some fun out there as the 32-year-old was seen making funny faces at one point. Not that he was done serving a dose of laughter to his fans. During the courtside interview, John McEnroe asked Nadal if he could take his shirt off and celebrate like Tiafoe did at the end of all his wins earlier at the tournament. McEnroe, naturally, didn’t agree to what Nadal said given the fact that the latter is one of the fittest guys in the circuit. McEnroe continued: “You could have fooled me. It looks pretty damn good to me. “Would you care to do it one time for the crowd? “I’m sorry,” he concluded after drawing no positive response from Nadal.